Former Democratic Colorado governor and Denver mayor John Hickenlooper told the Rev. Al Sharpton in an MSNBC interview on Saturday that Virginia Gov. Ralph Northam must resign in the wake of brewing scandal over racist images on his medical school yearbook page. “I don’t think there’s any question he has to step down,” Hickenlooper said, also bringing up the divisive behavior of President Donald Trump. “Part of what a governor does is bring people together, especially in this time in this country where we have a president who’s dividing us more fiercely than ever. “We’ve seen acts of racism across the country where white supremacy is growing. 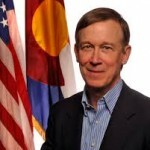 A governor’s got to be able to bring people together and reassure them that we are unified,” Hickenlooper added. Trump, after deadly riots in Charlottesville, Va., in 2017, said there were “fine people” on both sides as white supremacists marched into town and stoked deadly confrontations. Asked by Sharpton if he is planning to run for president in 2020, Hickenlooper said he’s “a few weeks away from that decision” but has been thinking about what it would take for a proven pragmatist to bring the country back together again. Hickenlooper said he’s never seen a time when the country was more divided, including during the Vietnam War. Northam, meanwhile, is digging his heels in over his 1984 yearbook page, claiming he is not one of the two people pictured on his page – one in black face and one in a Ku Klux Klan robe, although he admitted to doing black face the same year in a Michael Jackson dance contest that he won. Northam, a Democrat, is facing bipartisan calls for him to step aside. He originally apologized for the racist photo and then a day later denied he was in the photo.